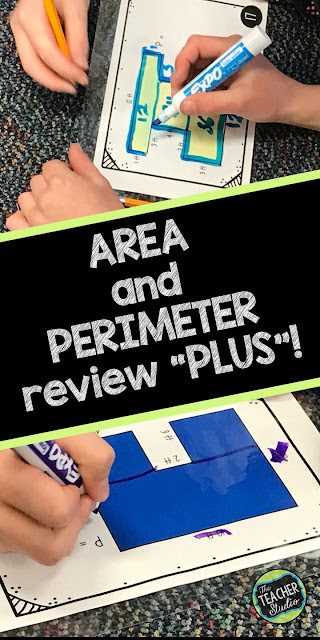 Area and Perimeter Studies: Part 2–Math Talk, Guided Practice, and More! 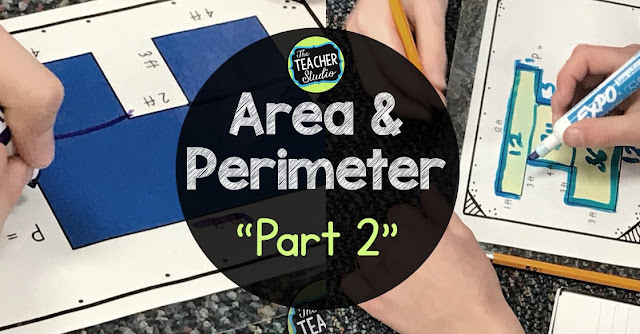 I blogged a few days ago about some of the fun area and perimeter activities we had done in class (If you missed it, just CLICK HERE.) and I promised you a follow-up post! With “big” concepts, I tend to have a sequence of teaching that doesn’t really follow a formula but does have a certain sequence. First of all, I want the students to explore and build their understanding. That’s what that first post was all about–immersing students in meaningful activities to develop their foundations. Once that happens, we do need some guided practice and formative assessment to see where students are with their depth of understanding. Sometimes this means I use some of the lessons that area a part of our math series, sometimes it involves other practice activities. 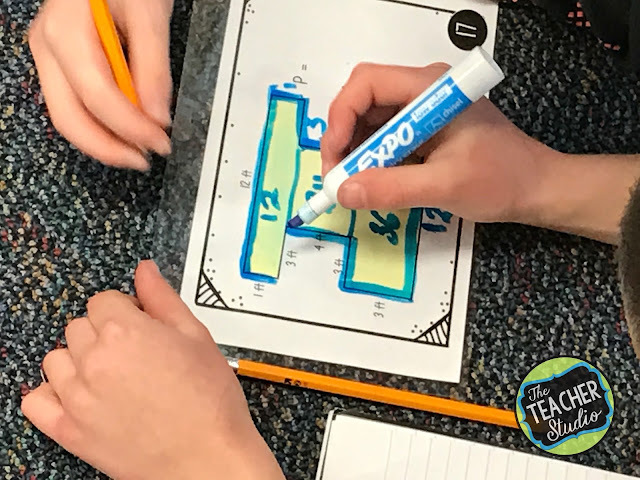 After I taught a few mini-lessons from our math series, I wanted to give students the opportunity to practice finding area and perimeter–and time for me to observe and look for any misconceptions and problems. Here’s what I did. I used a set of task cards that were differentiated by level and put them in a giant circle around the room (I couldn’t ‘get a good picture that showed this! Just picture 20 cards scattered around the perimeter!). 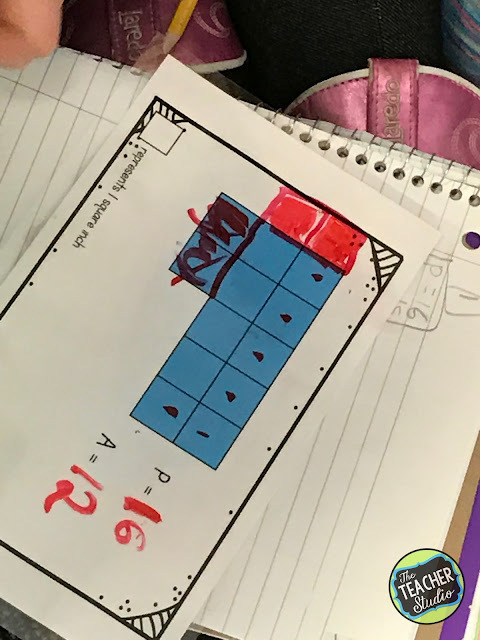 I explained to the students that the cards asked them to find area and perimeter–and were arranged in order from most simple–rectangles and shapes with the grid built in–to more complex shapes. 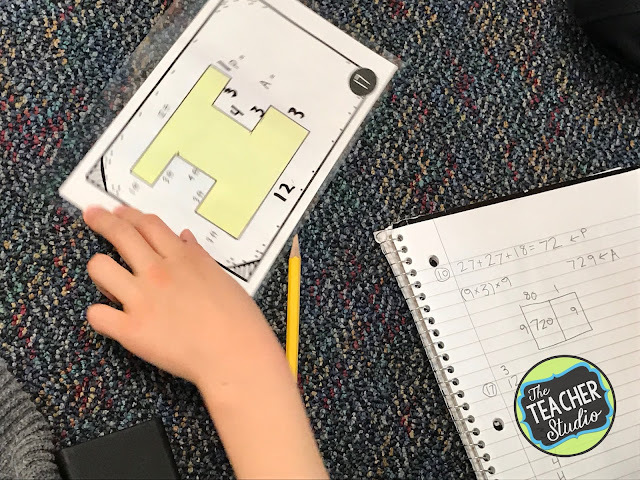 I partnered students up with partners of similar math abilities and asked them to start at a location that they thought matched their confidence level. 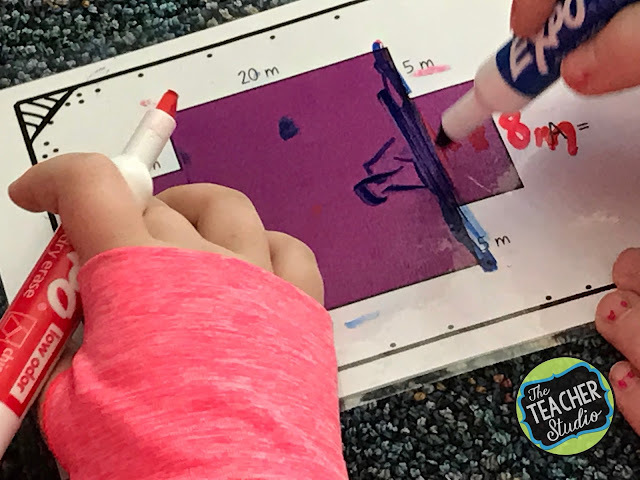 I asked them to take a wipe off marker, their math spiral, and something to erase with (most of my students have a sock or washcloth in their desk). Their job was to solve a card as a team, make sure they used math talk to “prove” that their solutions were correct. I encouraged them to write directly on the cards to help with that “proof”. As they solved a card, they then moved to another one. I had a blast walking around and listening to their thinking…this card was being tackled by some of my struggling students. The strategy? 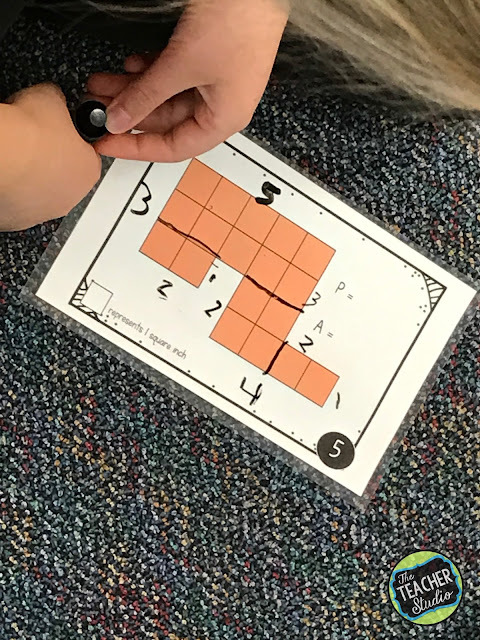 One of them suggested “moving” the bottom two squares over to the end to make it a rectangle which would be easier to count. It took some convincing to get her partner to believe it (we actually broke out some tiles and built it) but the light bulb went ON after that! 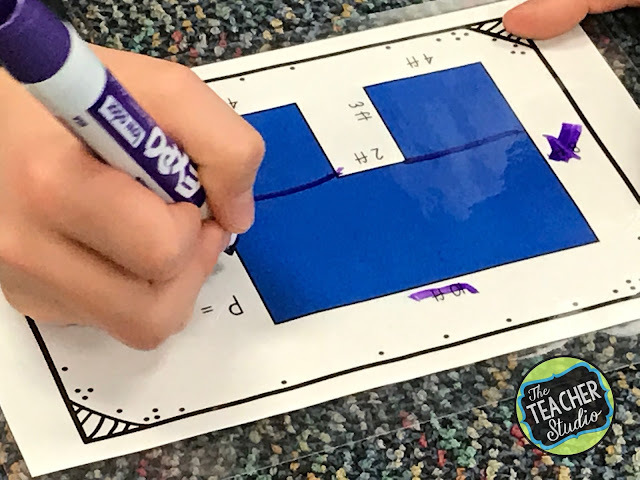 We had investigated two strategies for finding the area of these irregular shapes–finding the entire rectangle and subtracting the missing “bite”, and subdividing the shape into smaller rectangles. If students were working quickly, I asked them to try both methods to confirm if they were getting the same amount. This partnership was REALLY struggling with their math talk! (See that really dark blue line? She traced over it about 12 times to try to make her point!). The two students had totally different answers and neither were having much success being open to other ideas. I listened to them for a little while and then asked another partnership to join them to try to get them “unstuck”. It worked. I was able to keep a running list of students who seemed to be struggling–but the best part was that there was some amazing teaching being done from student to student! The next day, I gave an entrance slip to take the temperature of the group, refined my “watch” list, and then planned for some reteaching for those who needed it. Not bad for about 25 minutes of math class! Interested in checking out these task cards? 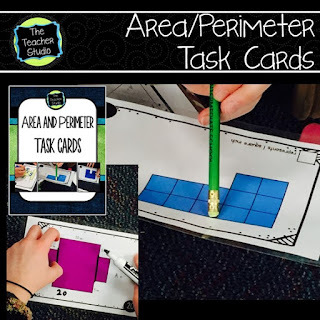 How about some area and perimeter formative assessments? Want to pin this post for later?